Benjamin Ralston is currently pursuing his PhD at the College of Law while teaching as a sessional lecturer. Prior to starting his PhD, Benjamin was in a term position as assistant professor, teaching in the Nunavut Law Program and on the Saskatoon campus before that. 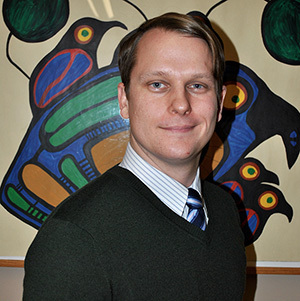 He has also worked in publications at the Native Law Centre and taught law as a sessional lecturer in both the College of Law and the Kanawayihetaytan Askiy program in the College of Agriculture and Bioresources since 2015. Benjamin completed his undergraduate and law degrees at The University of British Columbia and was called to the British Columbia bar in 2011. While in private practice he specialized in administrative law and civil litigation, working on files including various professional regulatory proceedings, the Commission of Inquiry into the Decline of Sockeye Salmon in the Fraser River, and the Joint Review Panel hearings for the Northern Gateway Pipeline. Benjamin went on to complete a Master of Laws with distinction at the University of Otago in Dunedin, New Zealand in 2014, before finally arriving in Saskatoon that same year. He joined the Law Society of Saskatchewan in 2015 and remains an active member, practising Aboriginal law on a part-time basis and supervising projects with Pro Bono Students Canada.